CyberLink PowerDirector gives you full creative control over the look and creation of your disc menu. The disc menu properties area provides a preview of the current disc menu that will be burned to disc. Click the Preview button to view a preview of your burned disc at any time. To edit text that appears on the menu page, including clickable chapter text, double-click on it, and then enter the new text. Modify menu text style, size, alignment and position using the text properties options located at the top of the disc menu properties area. click to remove the current background music from the menu. click to add background music with Magic Music. See Magic Music for more information. Use this option to add a video (or an existing CyberLink PowerDirector project) as a first play video to your created disc. The first play video plays automatically when the disc is inserted into a disc player, before the disc menu loads. No navigation buttons are available during the first play, and viewers cannot fast forward past this segment. In a professional production, this is usually a copyright notice or warning. However, you may prefer to use a personal introduction or other video clip instead. click and select the video file that you want. click to remove the video file set as first play. click to preview the first play video. Click the button to set how the disc plays back in a disc player. Select from one of the available playback modes in the list. Note: select the Auto menu time out option in the Playback Mode Settings window if you want your disc content to begin playing automatically after displaying the disc menu for the specified duration. When creating a disc with multiple titles or chapters, you can select the number of thumbnails you want to display on the menu or chapter page. Use the Buttons per page drop-down to select the number you want to display. Note: once you select the number of thumbnails you want to display, you can move the thumbnails (and any menu text) anywhere you want on your menu. Select Add thumbnail index to add numbering of your thumbnails to your menu page. The Menu Designer* lets you customize a selected disc menu style. Click on the Menu Designer button to open it and begin customizing the selected menu. Within the Menu Designer you can edit all three possible disc menu pages. To modify a specific page, select either Root Menu, Titles/Chapters Menu or Subtitles Menu from the Go to drop-down menu. Note: the subtitles menu page is only available if you selected Create subtitles for disc when you added subtitles in the Subtitle Room. See Subtitles for more information. On the text properties tab you can apply a predefined character preset for the menu text. After you have applied the predefined character preset you can go to font face, shadow, or border tabs to make further changes to the text properties if required. On the text properties tab you can customize the font used in menu text, including the size, color, font type used, weight, alignment, transparency and blur effect. On the text properties tab you can add a shadow around the text in the menu. Available options allow you to change the shadow’s color and size and add a transparency or blur effect. On the text properties tab you can add a border around the text in the menu text. Available options allow you to change the border’s color and size and add a transparency or blur effect. On the set object properties tab you can customize all of your menu properties. The tab lists all of the current objects on your menu, including menu buttons, navigation buttons and text. When you select an item in the objects list, the object is highlighted in the preview window. Once highlighted, the objects are easily edited, resized, reshaped or moved around the disc menu to a desired location. Note: when creating a menu with clickable chapter text, on this tab you can easily select, edit and position the clickable text objects to the desired position. – import a custom image into your disc menu. – add a new blank text field into your disc menu. – add a new button into your disc menu. Note: click on to use the TV safe zone and grid lines to help with the precise movement of the objects on your menu pages. 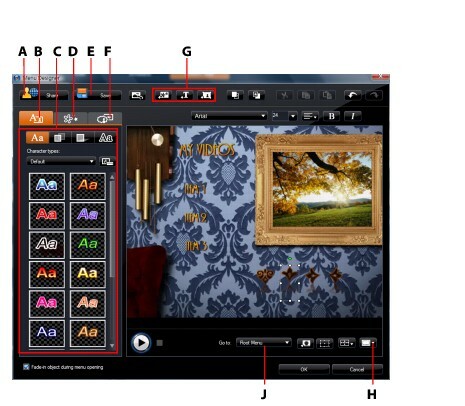 On the set button properties tab you can customize your menu and navigation buttons for your disc menu in the Menu Designer, by selecting a button frame, setting button position or setting a button highlight style. Note: if you selected a menu template that uses clickable chapter text, you can only customize the menu’s navigation buttons. click on to select a chapter thumbnail button frame style. Select Import Custom to import your own button frame style. click on to set chapter thumbnail button layout. click on to select a navigation button style. Select Import Custom to import your own navigation button style. click on to select a button highlight style. Select Import Custom to import your own button highlight style. To replace the background image or video in your disc menu, click on the Replace background image or video button . To select a video effect that will be dynamically applied to your disc menu, click on the Select a video effect button . Once you have finished modifying your disc menu template you can save it to the Menu Properties tab for future use or upload it to DirectorZone to share it with others. click on Share to upload your custom template to DirectorZone.